In Issue 864 of Rail Magazine there is an article about the Class 230 train demonstration in Scotland, that I wrote about in Battery Class 230 Train Demonstration At Bo’ness And Kinneil Railway. Vivarail is targeting Scottish routes such as Glasgow Queen Street-Anniesland via Maryhill for its converted London Underground D-Stock, now known as Class 230s. The Maryhill Line is a short line between Anniesland and Glasgow Queen Street stations. There is a shuttle service of two trains per hour, which appear to take about twenty minutes each way. The line is not electrified and is run by a two-car diesel train. Various works have been performed on the line in recent years to make it more useful and easy to operate. So why has this short line not been electrified? On Rail Forums, various reasons are put forward including. The Maryhill Line might not have the traffic for a three-car electric train. It could be a rather tricky electrification. There are also issues with lower-powered diesel trains climbing the incline out of Queen Street station, which seem to make creating a diagram for trains on the Maryhill Line difficult. I suspect that for air quality reasons, Transport Scotland would like to have less diesel trains in city centres. So a self-contained independently-powered two-car train, shuttling between Queen Street and Anniesland may be a viable solution? Would battery-powered Class 230 train be able to work the route? The trains would be the right size. They would be emission-free and quiet. The performance of the Class 230 train is probably enough to work the current service. Third-rail charging would be possible in the bay platform at Anniesland station. If required a charging rail could be added in Queen Street station. The platform at Anniesland station could be long enough to stable two trains overnight. Except for the charging systems, no new infrastructure would be required. It could turn out to be another quirky, useful and reliable railway to add to the Glasgow Subway. Paisley St. James station is the nearest station to Glasgow Airport and any rail-based service to the Airport will probably effect services through the station. It is not the best equipped of stations. The bridge is not step-free. It appeared not to have any ticket office or staff. There was a rudimentary shelter. Services are about one train every thirty minutes. I suspect, it could be a really nice station on a blustery wet day! The title of this post, is the same as that of this article in The Scotsman. I’m not bothered, as I doubt, I’ll ever go to Scotland to watch an important Scottish football match, that would be played at their National Stadium. But, I have been to Hampden Park before. I was there fifty years ago, when Spurs and Celtic drew 3-3 in the Glasgow Cup. I also suspect that the 91,000 plus crowd was the largest, I’ve ever been part of. And I was at Hampden to see the athletics in the 2014 Commonwealth Games. I have no view on the historic aspects of the possible move, except that there might be an economic case. And I also note, France, the Republic of Ireland and Wales all have a stadium, that is shared between football and rugby. But then Germany and Italy don’t have a national stadium for football. I can see another big argument between Edinburgh and Glasgow on this decision. Other the last decade though, transport links between and to and from Scotland’s two major cities have changed. There have been extensions to the road network across Scotland. The rail lines are being electrified and new higher-capacity Class 385 trains are being delivered. Passenger numbers at both Glasgow and Edinburgh Airports have grown. So at least getting to either stadium is becoming easier. It will be a difficult decision to call. This article on the Scotsman is entitled New ScotRail Trains To Ease Crush On Edinburgh-Glasgow Line. The article also has a rather interesting picture of a lorry-mounted train negotiating heavy traffic in Glasgow. It broadly welcomes the Class 365 trains, and this is a comment from a rail group. The article also confirms that ten trains will be going North. As there are a total of forty of the Class 365 trains, that will be replaced by Class 387 trains and new Class 700 trains, I wonder where the others will be deployed. The title of this post, is the same as thsat of this article on Rail Magazine. The Class 365 trains may have been delivered in 1995, but they are no scrapyard specials. I recently rode one to Cambridge and although some things are dated, the ride is good and they are 100 mph trains, just like the Class 385 trains. Wikipedia and others reckon that as many as ten trains will go to Crossrail. How Do The Trains Compare? The trains are of different generations but how do they compare? and a four-car Class 385/1 train. As the cars are twenty-three metres long, that gives a train length of 161 metres. Each four-car Class 365 train is 81.9 metres long, so an eight-car unit would be just under 164 metres. I doubt that three metres would cause too many platform-length problems. The capacity of a three-car Class 385/0 is 206 seats, so I suspect a four-car Class 385/1 would seat around 275. This would give a total capacity for the seven-car train of 481 seats. I can’t find the capacity of a Class 365 train, but it has 2 +2 seating and a fair sprinkling of tables, so I suspect the capacity of the two different formations is not that different. Both trains have a 100 mph operating speed. I suspect that the Class 385 trains will be more to the standard ciustomers expect, wth wi-fi and power sockets and probably more tables. But the Class 365 trains are one of the better 100 mph long-distance commuter trains, rating above Thameslink’s new Class 700 trains and below the Class 387 train. The Class 365 trains will make quality substitutes. The title of this post is the same as that of this article in Rail Technology Magazine. I’m not totally sure, but it looks like they will complete the overhead wires between Edinburgh and Glasgow along the Shotts Line. They certainly seem to be moving on apace with electrification in Scotland, unlike around the North West of England. The service between Edinburgh and North Berwick stations is going to be one of the first to get the new Class 385 trains. So I took a quick trip. The North Berwick Line appears to be a well-maintained line with tidy, simple stations and copious car-parking. North Berwick station shows how you can have a single-platform station handling two trains per hour (tph), where both are six cars. The North Berwick Line is becoming increasingly busy and the six-car train I rode out of Edinburgh at ten in the morning was surprisingly busy. The current Class 380 trains were built in 2009-2011, so why are the trains being replaced with Class 385 trains on this route? Both trains have the following shared characteristics. Ability to run in pairs with through gangways. I think that the big difference is that the newer Hitachi trains will have wi-fi and possibly a 4G connection. But other than that, the two trains would be interchangeable. There is also the fact that Abellio seem to be very expansive with the plans for their franchises in the UK. As some of the North Berwick services start at Glasgow Central station, could it be that Scotrail are planning to use North Berwick as the terminal for a two tph Glasgow Central to Edinburgh via Motherwell service, in addition to all the other services going to Glasgow Queen Street station. Effectively, by using North Berwick, they gain a much needed extra platform at Edinburgh. ScotRail might have also decided that all Glasgow to Edinburgh services should be equipped with wi-fi and run by the new Hitachi trains. Passenger numbers are rising at North Berwick station and last year there were over half a million passengers. The single platform handling six-car Class 380 trains can probably handle several hundred passengers an hour. 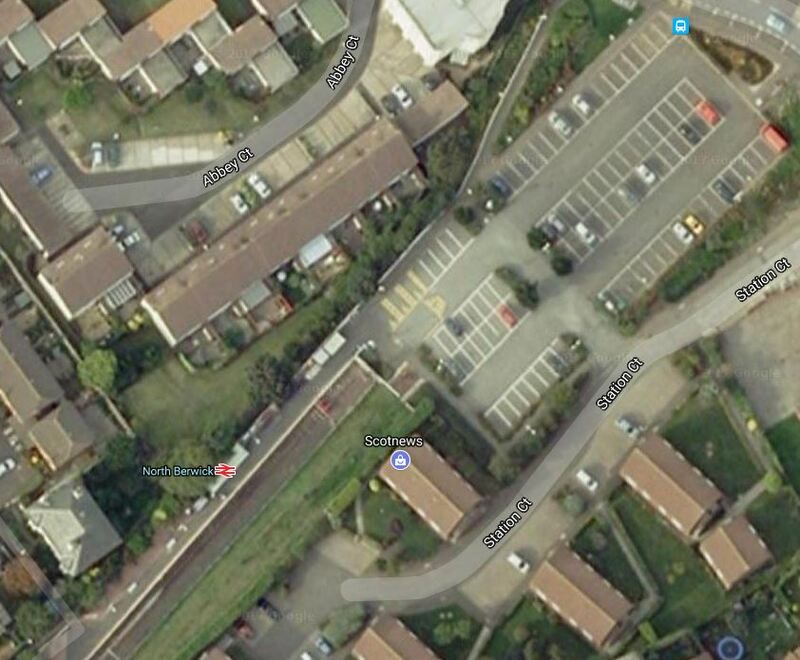 But look at this Google Map of the station. Is there enough car parking for this number of passengers? When it is considered that with modern signalling, it might even be possible to inrease the frquency to North Berwick to three or even four tph, the platform would cope, but routes to the station probsbly wouldn’t. There have been proposals to reopen a station at East Linton, a few miles away on the East Coast Main Line. In the Wikipedia entry for the station, this is said under The Future. Proposals to reopen the station, along with the former station at Reston, have received the backing of John Lamont MSP, who has taken the case to the Scottish Parliament. A study published in 2013 proposed that East Linton and Reston stations be reopened. Since Abellio ScotRail took over the franchise in April 2015, they have now committed to reopening East Linton and Reston Stations as part of the local Berwick service by December 2016 but due to the shortage of rolling stock this will now commence in December 2018. As now the extra trains are being delivered, a station at East Linton must be increasingly possible. Would a rebuilt Reston station be used as a terminus? This Google Map shows the village of Reston with the A1 and the East Coast Main Line. Could Reston station be rebuilt as a Park-and-Ride station with perhaps a bay platform for suburban services from Edinburgh? Space doesn’t seem to be a problem. Drivers from the South and West might be tempted to abandon their cars and use the train. Reston could be a terminus for Glasgow to Edinburgh services. Scotrail certainly have possibilities to develop an electric service between Edinburgh and Glasgow, that is a lot more than just a simple link between the two major cities. The electrified Edinburgh to Glasgow service could develop into a fast and frequent Crossrail For Scotland. Will High Speed 2 Have Go-Anywhere Trains? I ask this question as after writing Plans For Toton Station For HS2 Are Beginning To Emerge, I started to think about the specification of the trains that will work on HS2. Extending HS2 to Sheffield from Toton will eventually be via a dedicated High Speed Line, where the trains can run at their design speed of 225 mph. But Toton HS2 to Sheffield via Chesterfield will be linked by the Erewash Valley Line, where trains will be able to travel at least as fast as 125 mph. The Erewash Valley Line will probably be electrified before HS2 opens to Toton HS2 around 2030, to bring Sheffield consistently under two hours from London. Similarly Crewe to Liverpool will not be getting a dedicated High Speed Line, but there is already a route where at least 125 mph is possible. As passengers won’t want to change trains, Liverpool will get two trains per hour (tph)from London on HS2. The only work needed North of Crewe would be to create extra and longer platforms at Liverpool Lime Street, provided that the new HS2 trains can work on classic high speed lines like the West Coast Main Line. These improvements at Liverpool Lime Street are actually underway and knowing Scousers as I do, you could bet your house on it being ready in 2027, as they would want to have HS2 services at the same time as Manchester, if not a couple of years before. We should also look at how the French do things. If you travel from Biarritz to Paris via a TGV, the service runs on both High Speed and classic lines. From the Liverpool and Sheffield examples, I suspect that we will adopt a similar philosophy. Consider when HS2 opens, the places that could be served directly from Crewe. Manchester Piccadilly, if there is platform space. Warrington, Preston, Carlisle, Glasgow and Edinburgh – Why not? Chester and Holyhead – If the North Wales Coast Line is electrified, as has been threatened! Note most of the West Coast Main Line routes are covered. Can this explain the decision to combine the HS2 and West Coast Main Line franchises and the early extension of HS2 to Crewe? The new franchise could even use the same 225 mph trains for HS2 at a slower speed on the West Coast Main Line to replace the Pendelinos. The only disadvantage would be that the new trains couldn’t take advantage of the more generous HS2 loading gauge, unless of course the classic lines, where they are to run have their gauges enhanced. This may already be the case, as many of these routes have a loading gauge of W10 to take large freight containers. I think we’ll be seeing a very interesting specification for the HS2 trains. 140 mph Pendolino performance on classic lines where possible. Short and long trains. Class 800 trains and others seem to be ordered this way, as five and nine/ten car units. Automatic coupling and uncoupling of units, just as Class 395 trains do now! As the trains won’t be delivered for nearly ten years, wouldn’t be surprised to see that they have a 100 mph independently-powered capability of perhaps 100 miles. This would enable the trains to reach places like Aberdeen, Barrow in Furness, Blackpool, Inverness and Lincoln from the West Coast Main Line or Phase 1 of HS2. It may seem strange to use perhaps onboard energy storage to extend services away from HS2. But this capability would probably only be given to the shorter trains that can join and split at Crewe or Birmingham International for fast running to and from London. Generally, when operating on onboard energy storage, the trains will be travelling at slower speeds. so less energy is needed. This would mean that places like Barrow-in-Furnace, Blackpool, Cleethorpes and Lincoln could be easily added to the high speed network. The High Speed network could also be expanded by improving the current network with selective electrification and the capability for higher line speeds. All of these improvements on the classic lines, would mean that local and freight trains were able to provide a better service too! Coupled with HS2, they would make a wonderful marketing opportunity. I estimate the following using new trains and HS2 from Crewe, when Phase 2a of HS2 is complete. Glasgow-London would take under four hours for the journey as opposed to just over four and a half hours now. Liverpool-London would come down from two hours twelve minutes to one hour 33 minutes. Preston-London would down from two hours fifteen minutes to under a hundred minutes. Wigan-London would come down from just over two hours to just 87 minutes. And some commentators and politicians doubt HS2 is needed. Certainly, the decision to extend as fast as possible to Crewe was a very good idea. Consider going from Euston to Glasgow in say 2028. The train would run from Euston to Crewe at full speed of 225 mph stopping if required at Old Oak Common and Birmingham International in a time of 58 minutes. From Crewe to Glasgow, the train would run at least at 125 mph stopping as appropriately. Selective improvements and in-cab signalling would reduce journey times from those of today to the North of Crewe. Ten years or so later, the journey time will be even faster as the High Speed line was extended past Crewe. I have never seen such a powerful argument for improving local transport links and especially trains than this article in the National. It is written by a train driver turned local politician and he is talked about Glasgow. But his arguments can be applied to any city in the world.